On their first album, a self-titled 2010 release, San Francisco’s Reptiel pulled together a sound that was part indie rock with a deep infusion of garage psychedelia, part rhythmic Krautrock exploration, and a dash of progressive rock thrown in for good measure. 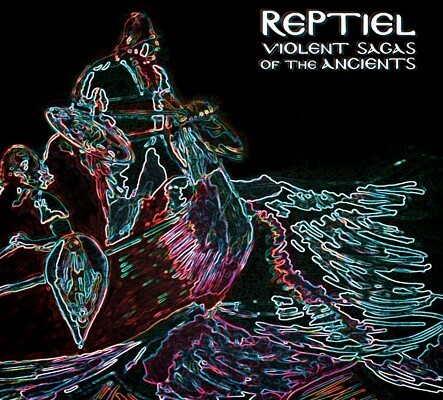 On 2013’s Violent Sagas of the Ancients, the band practically inverts their sound, letting their Prog Flag fly proudly, without totally forgetting their psych and Kraut roots. Formed from the ashes of the bands The Cubby Creatures (who I reviewed way back in AI #32), Thee Druggles, and Thee More Shallows, the four member group set out to create something they called ‘Yacht Psych’. I’m not entirely sure what that means, but what we have here in Violent Sagas of the Ancients is the kind of album that will take you right back to 1971, to a time when prog was being born in a haze of psychedelic smoke and anything seemed musically possible. Intricate and dynamic tunes played on vintage sounding instruments? Check. A sweeping and trippy mythological concept to the lyrics? Check. Arpeggiating keyboards and wild synth solos? Check. Complex vocal arrangements and virtuoso playing? Check. It’s all here! Well, all here except for the side-long epics. Reptiel rein in the length of their songs to fewer than 6 minutes each. But then again, since the whole thing kind of forms one big epic, complete with Prelude and Postlude and a Fanfare in the middle, melodically linking it all together, it could almost be said to be one 30-minute long piece. That being said, Violent Sagas of the Ancients is definitely more than the sum of its parts. The songs themselves stand-alone quite well, each on their own. From the stomping theatricality of Byzantine Standard to the pure classic progressive rock with folk influenced melodies of Servants in the Place of Truth to the acidic weirdness and sweet harmonies of On and On, there is some amazing song-crafting here, with wild dynamics and melodic hooks to spare. In short, if you want to journey back to the early 70’s, but hear something fresh and exciting and new at the same time, definitely check out this album. Highly recommended!